The Cleveland Metropolitan School District (CMSD) has started a process to seek a four-year renewal of the 15-mill levy that funded the first five years of The Cleveland Plan. The last four State of the Schools addresses have focused on the progress CMSD has made in service to Cleveland's families, including increased graduation rates and the opening of a varied portfolio of school options for families. Progress hasn't been across the board, however, and challenges remain. 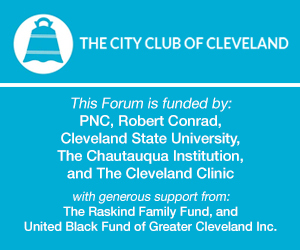 This City Club Forum is the annual tradition of hearing from CMSD CEO Eric S. Gordon, leader of the region's largest public school district - a district whose improvement many believe is key to the future success of our city and region.